Buzz and his date watch me talk about - Buzz. 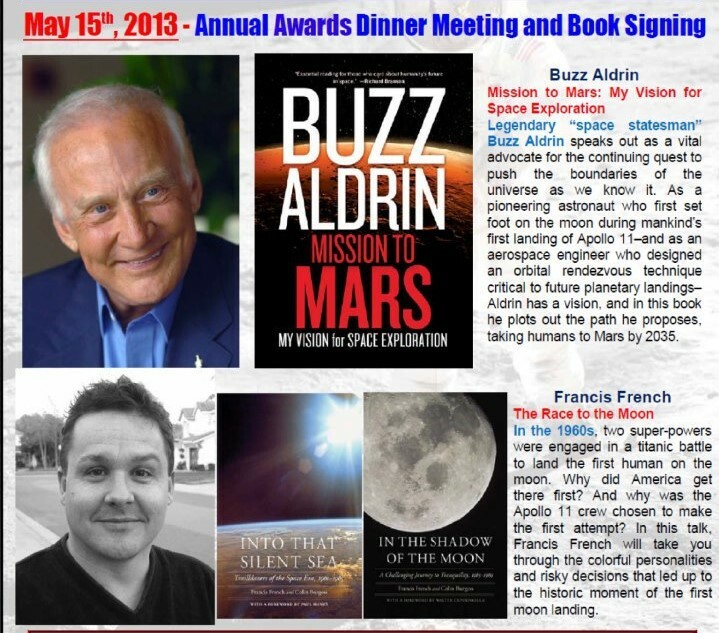 The 50th anniversary of the first moon landing is coming up in a few months: it got me thinking about the weirdest evening I ever spent with Buzz Aldrin. Buzz is the last surviving member of that very first moon landing. He is also the second astronaut I ever met – back in 1993 at an event in Hastings, England. I remember arriving in town, wondering what this space legend would be like. Would we get to talk? Would he describe that first moon landing? Would we somehow connect, and I’d glean some idea of that historical moment? Would I get to know what it was like? Good grief, it all sounds so naïve. Buzz Aldrin was, naturally, his own person, rather than what I wanted or expected him to be. He was someone who’d moved on from that time in his life – although he had no problem using that fame to advance his new ideas. He was still deeply into space exploration, but the things he came to the conference to talk about were far beyond the moon. They were complex architectures to send humans out to permanent settlements in space, constantly resupplied in a beautiful ballet of orbital mechanics. He did what people hoped he would. Posed for photos. Signed autographs. Shared some moon stories. However, it was obvious he did so because everyone wanted him to, not because it was something he cared about. He also seemed like he’d be a difficult person to connect with. His face seemed set with a rather serious look, and his eyes would dart around when people spoke to him as if he was thinking of something else, something more important he had to attend to. He was there, but he wasn’t. It could have been disappointing, but it was actually a good lesson. I saw that everyone at the event was like me – wanting that moment of connection. For each of us, it was an anticipated event. For him, it was every damn time he turned around. Tried to go to the rest room. Tried to walk down a hallway. Every day. For decades. I’m glad it wasn’t the only time I met him. Over the years, we ended up working together quite a lot. He would agree to be interviewed by me for magazine articles; I would help host book signings for him. He also kindly did a bunch of interviewing for books I wrote. And there were those moments, sitting on his couch in his home with the tape recorder running, covering some little moment in his astronaut career, when I could see him reach back into those original, decades-old memories and – there was that moment I’d craved when I first met him. There was that unique moment of sharing. But I’m digressing here. None of these were the weirdest evening I spent with him. That came in 2013, at an awards dinner in Los Angeles for the American Institute of Aeronautics and Astronautics. They’d asked me to give the after-dinner speech, which was quite an honor. I’d created a talk at their request about the space race, culminating in Apollo 11. It included how each of the crew members ended up on that iconic mission, and the tense and alarm-filled descent to the lunar surface while the fuel tanks grew ever emptier. Not long before the event, I received a phone call from the organizer. Buzz Aldrin had a new book out, about Mars. He lived just up the street from the venue, and he’d told the organizers that he wanted to come and give a talk about it at the event, and sell some books. They had said yes. No problem, I said. He’s a much bigger draw than me. I appreciate the call. Perhaps another time. No, I was told – you don’t understand. We want you both to talk and sign books. And we want you to stick to the same talk subject. And so began a surreal evening. In the twenty years since I had first met him, Buzz had gradually become even more - Buzz. More jewelry. More facial surgical enhancement. More extremes of swagger and silence, it seemed. He was eager to command a crowd and explain his theories, but also seemed ever more ready to escape any individual attention. He was certainly less keen than ever to go over his moon landing moment. Somehow, bizarrely, that was going to be my job. We ate dinner at the same banquet table – the fanciest one. I imagined what my 1993 self would have made of this scenario. Buzz had brought along a date, a French plastic surgeon who seemed less than thrilled to be in a crowd of space engineers. “I don’t know why he brought me here,” she sighed in a fit of Gallic drama, as if she was living the lyrics of an Edif Piaf song. “I have told him, I get so booooored with this space stuff. And yet, he brings me.” I understood. A space engineering conference isn’t everyone’s idea of a fun night out in LA. So we talked about Paris. And Buzz chewed his food and looked at his phone. And then, I was up. Looking out at a crowd of hundreds of space professionals, many of whom probably worked on the Apollo program themselves. I had decided weeks earlier not to talk about the technical side of things – they knew all that already – but about the personalities, the individuals who made it possible. And now one of the key people in my talk was sitting there, listening, a few feet away. I was talking through the moon landing, pointing to him on occasion, saying “and then, this guy…” – the audience were laughing and loving it, but I was thinking, could this get any weirder? And what if Buzz doesn’t like it? What if he says that? On stage? I finished my talk, and it seemed like people really enjoyed it. Even the French doctor seemed to have perked up, and asked me some questions that made me feel like she was finally a little more interested in the person who brought her to dinner. But there wasn’t much time. Buzz was up next. The segue worked. Picking up from where I left off, Buzz took the audience further, out to Mars. 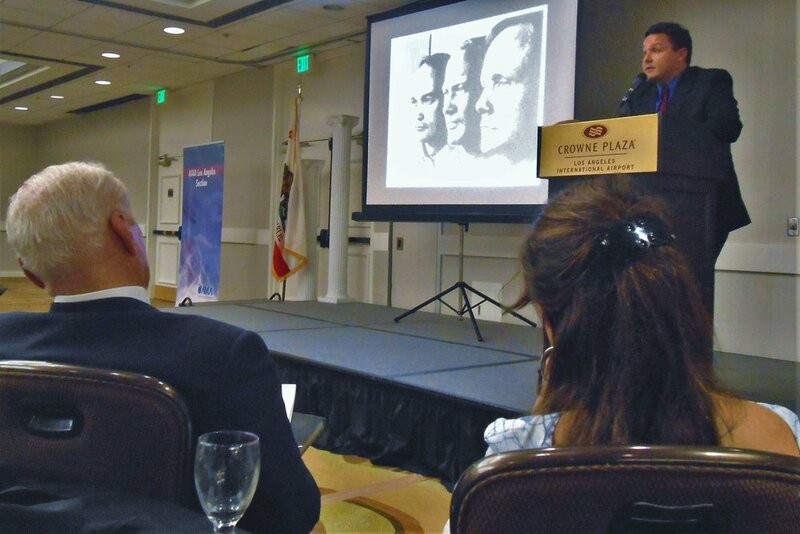 Complicated bar charts appeared on screen, and mathematical depictions of orbits looping around the solar system – but this audience was a bunch of engineers, and they spoke Buzz’s language. He seemed pleased to have the opportunity to cover every little detail. And I thought, good enough.